A delicious weekday meal that is perfect if you are short of time. 1. Preheat the oven to 200ºC, gas mark 6. Warm half the oil in a large saucepan over a medium heat. Cook the shallot and garlic for 2 minutes, stirring throughout. Stir in the spelt, then the stock and sage, and simmer uncovered for 30 minutes. Stir occasionally, until the spelt is tender and most of the liquid has been absorbed. 2. Meanwhile, cut the squash into 1cm pieces and the onion into thick wedges. Toss both in the remaining olive oil, then spread on a baking sheet and roast for 25 minutes, tossing and adding the tomatoes halfway through. 3. 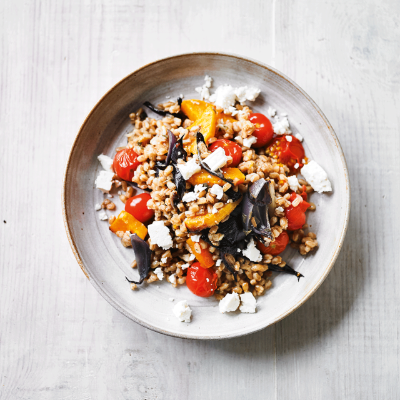 Fold the roasted vegetables into the risotto, season and serve with a scattering of feta on each portion.